FAQ regarding the RoadAid applications. How do I return to my current location after panning the map? What happens when I click on an incident on the map? What is the List view used for? How to use Facebook tab? What does Dynamic zoom mean? What does Alert display duration mean? What does Dynamic distance mean? What does it mean to share traffic insight with Facebook friends and Twitter followers? Is it possible to delete a wrrong incident I have made myself? What are Thumbs up / Thumbs down used for? Is there any difference in reports between map or list view? You return to your own location by clicking the blue "My location" icon in the top left corner. The black circle will change from black to red to show that it is now tracking your location. Click on the red "Report" button and a new screen will appear with option to choose incident type. If the incident is in the opposite lane, choose "Opposite my travel direction". If the incident is valid for both travel directions choose "Both travel directions". You can write an optional comment to help other commuters, when they receive the incident. Choosing the incident type "Road construction" will give you the option to select an end date. End date cannot be earlier than the following day. Police / photo van: Speed limit control either using radar, mobile photo cameras or enforcement of seat belt, handsfree etc. Fixed speed camera: Traffic enforcement cameras that are fixed in position and are always active. Traffic: Close traffic where travelling speed is lower than the allowed speed limit. Traffic congestion: The traffic has completely stopped or is moving a few meters at a time. Also known as "bumper to bumper". Caution advised: A situation where the driver needs to exhibit additional awareness. This can be caused by dropped goods on the road or an accident where all concerned cars might still be on the road. Road construction: Local or major road constructions. You will be given a detailed view of the incident. These include, but are not limited to, direction and your distance to the incident, comments and the time of the reported incident. If the incident is of the type "Road construction", the detailed view will also include the expected end date for the construction. What is the "List" view used for? 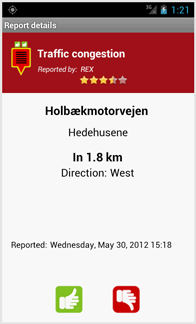 The list view gives you a quick overview of incidents around your location. The incidents are sorted by distance. When clicking on a specific incident, it will switch to map view and show the incident on the map. On the other hand, if you click on the incident icon, a detailed report view will pop up. Here you will have the possibility to rate the incident using "Thumbs up" or "Thumbs down". See further description of this function under "Incidents/reports -> What are Thumbs up / thumbs down used for?" 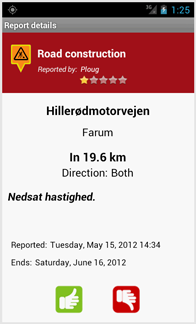 Receive Facebook speed control warnings directly in the RoadAid app! By activating, you will receive posts that others wrote on your preferred Facebook speed control warning page, while driving. This gives you not only the warnings that are reported exclusively by RoadAid users, but also the reports that others post on Facebook. One of the advantages is that you only see the warnings, when they are relevant. When you are driving! Now you can turn off Facebook notifications for speed control pages. There is no need for your phone to constantly beep when you're not in your car. Facebook warnings are only available when the RoadAid app is running either on the map or list view. For higher relevance, we have chosen to show only the last 3 Facebook posts on each warning while driving. If you want an overview of the warnings that continuously are added into Facebook throughout the day, you can do this by going to the Facebook tab and select 'Posts '. How do I enable Facebook warnings for RoadAid? 2 . Enable Facebook feature in RoadAid, under the new Facebook tab. 3. Select the groups you want to receive warnings from while driving. 4. Note that you, as an added bonus, can get a quick overview of the posts on the Facebook groups. What does "Dynamic zoom" mean? Dynamic zoom will automatically adjust your zoom level on the map according to your travel speed. The faster you drive, the more the map will zoom out, in order to give you the best overview and visibility for incidents that are relevant for you. What does "Alert display duration" mean? It means how long the proximity alert will be visible on the screen. What does "Dynamic distance" mean? It means that RoadAid will automatically choose the best alert distance to warn you about incidents that are relevant to you. It means that the incidents you report will be posted on your Facebook wall and/or tweeted on your Twitter profile. 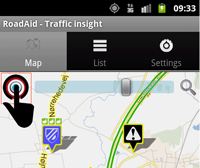 This way you enable your friends to be alerted about traffic problems, if they haven’t already downloaded RoadAid. No it is not possible to delete incidents. This is why it is important for the quality of the reports that you do not report invalid incidents. You kan however mark an incident for deletion by using the "Thumbs down" functionality in RoadAid. Read more under What are Thumbs up / thumbs down used for? RoadAid reserves the right to suspend users who repeatedly report false incidents. 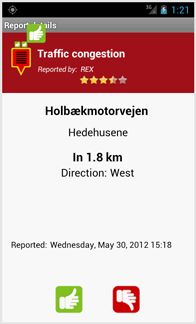 As a RoadAid user you can participate in keeping the content updated by using the thumbs up and down buttons. The buttons are visible if you click on an incident either on the map or on the icon in the list. By using these buttons, you indicate if an incident is (still) valid or invalid. RoadAid’s systems will act accordingly upon these updates. For instance an incident will be marked for deletion, if a specified amount of users gives it "Thumbs down". On the other hand, valid incidents will be kept active longer, if users gives it "Thumbs up". 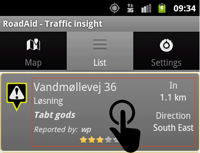 RoadAid’s servers will generate up to 3 "Thumbs up" icons on the incident the more users indicate that it is valid. Incidents of the type "Fixed speed camera" will never automatically be removed by the RoadAid system. The reason being that fixed speed cameras, also known as traffic enforcement cameras, have a very long lifetime. In this situation the users "Thumbs down" will decide if the incident will be marked for deletion or not. When a specified number of "Thumbs down" are submitted, the RoadAid system will mark the "Camera" as marked for review and then delete it if appropiate. By using these functions you are participating to increase the quality of the incidents in RoadAid. 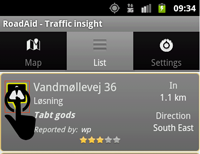 This is a benefit for all RoadAid users, whom will be able to count on updated traffic information. There is no difference. You’ll have the same options to view the incident and its details. Select what’s most preferable for you.